Girl's Swim Team 6th at State!! Brady Marunde had 15 points and Matt Finitzer added 10 as the Wolves overpowered visiting Arlington in a non-league makeup game last night. The game was postponed last month due to snow. Sequim hosts Chimacum today. Arlington -- Gunter 2, Camp 5, Thompson 2, Huleat 3, Carpenter 2, Campton 1, Devery 9, Lowber 6. Sequim -- Sean O'Mera 6, Rutherford 5, Evan Still 5, Jerry Pederson 8, Brady Marunde 20, Matt Finitzer 10, Riesau 3, James Brabant 8, Maguire 3. February 3, 2004 - Steilacoom H.S. Michael Richardson scored 10 of his 21 points in the first quarter as Steilacoom jumped on the cold-shooting Wolves early and then held on to win. Sequim (11-4, 7-2) pulled within 56-55 with 2:30 left on a Chris Mobley free throw. Mobley missed the shot free throw that would have tied it and the Sentinels (14-1, 8-0) then "made the plays down at the end," said Sequim coach Brian Roper. Brady Marunde scored 21 for the Wolves, who are at Port Townsend Friday. Steilacoom -- Benito Richardson 2, Todd Lynch 11, Mike Respicio 1, Brandon Jones 8, Woody Wilson 4, Michael Lewis 21, Derrick Schluter 4, Cody Balogh 10. 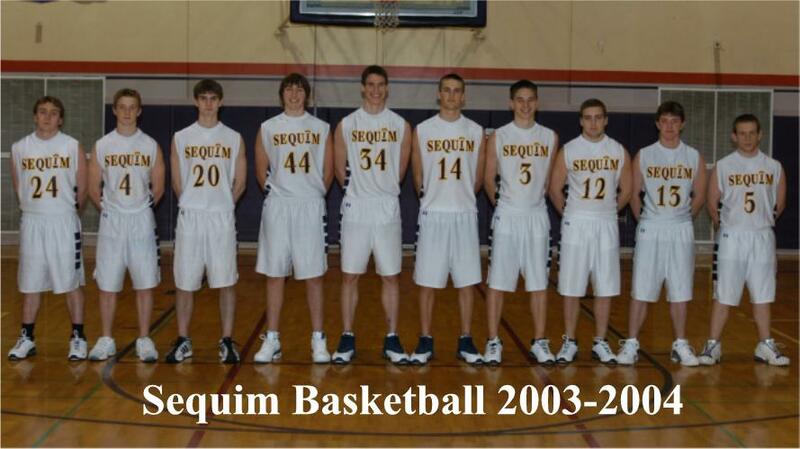 Sequim -- Ryan Rutherford 1, Evan Still 3, Jerry Pederson 2, Chris Mobley 11, Brady Marunde 21, Matt Finitzer 4, James Brabant 11, Sean O'Mera, Wes Maguire. The Wolves' James Brabant led a balanced attack with 15 points and 10 rebounds. The Wolves are at Steilacoom in a matchup of division leaders on Tuesday. Orting -- Lawrence 13, Caldwell 12, Webber 3, Black 4, Halahuni 2, Mack. Sequim -- Sean O'Mera 2, Ryan Rutherford 4, Jerry Pederson 5, Chris Mobley 11, Brady Marunde 11, Matt Finitzer 10, Arlen Reisau 7, James Brabant 15, Chad Wagner 3, Josh Brocklesby 2. James Brabant made 1 of 2 crucial free throws with 7 seconds left to put the Wolves past the PA Roughriders in a non-league clash of north Olympic Peninsula rivals. PA squandered a last second shot, clanging off the front rim as the final buzzer sounded. Chris Mobley and Evan Still, a fine soccer tandem earlier in their days, led the Wolves with solid floor leadership. Sean O'Meara - Sean is a scrappy junior forward who plays with heart and enthusiasm every day at practice. He is among the most encouraging player I have ever been around. He's great teammate. Evan Still - Nails is his nickname (because some think he is tougher than nails). A solid point guard who is never flashy, but always steady. He finds the open man. His teammates voted him co-captain as a junior, which speaks to his leadership ability on the court. Jerry Pedersen - Just off the football field, Jerry, a senior guard, is a tough defender and aggressive player. He can get out and run the floor and is willing to dive on it for a loose ball or two. Matt Finitzer - "Finitz" is a senior forward who started most of last year. He has a great first step and can shoot the three. Best of all, he's a great teammate, always positive and encouraging. James Brabant - James is a senior forward who is a great athlete. He can really run and jump so the comparisons to Coach Hill come often. James has been one of the most improved players during the past two years and his potential is limitless. Great offensive rebounder. Brady Marunde - Brady is a multi-dimensional player who can shoot the three, drive and post up. He is a co-captain and a returning all-league player. A senior, Brady is coachable and team-oriented. He has a bright future at Sequim. Arlen Riesau - "R" is our utility specialist. He can play all five positions. No one has worked harder than "R". He loves the game and plays whenever he can. He has a good mid-range game and can handle the ball. Chris Mobley - "Mobes" is a senior combination guard who can shoot or take people off the dribble. He is a crafty player who is a good student of the game. We expect him to be a scorer for us this year.